Mercedes has unveiled the S 250 CDI BlueEFFICIENCY. It features a four-cylinder diesel engine with 150 kW (204 PS / 201 hp) and 500 Nm (369 lb-ft) of torque. 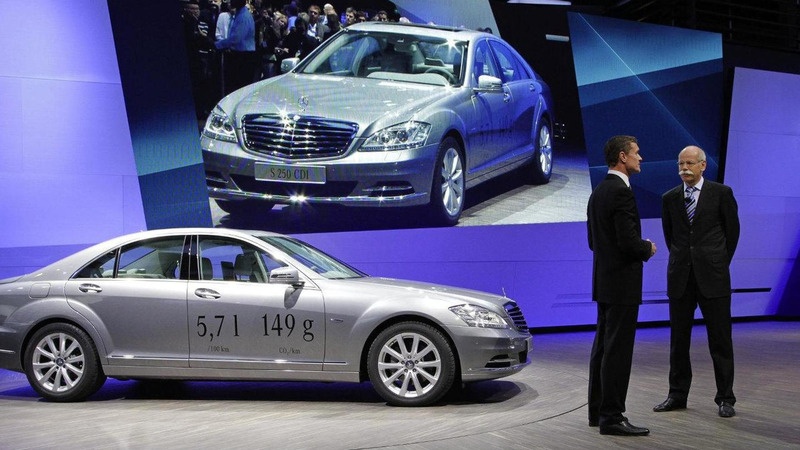 Mercedes has unveiled the S 250 CDI BlueEFFICIENCY at the Paris Motor Show. As the name suggests, the car is powered by a four-cylinder diesel engine which produces 150 kW (204 PS / 201 hp) and 500 Nm (369 lb-ft) of torque. While this sounds like a sign of the apocalypse, the S 250 accelerates from 0-100 km/h in 8.2 seconds and hits a top speed of 240 km/h (149 mph). More importantly, fuel consumption is 5.7 liters per 100 kilometers (41.2 mpg US) while CO2 emissions are 149 g/km. To get those class leading figures, Mercedes outfitted the engine with twin-turbochargers and a start/stop system. Furthermore, engineers "extensively revised" the seven-speed automatic transmission (called the 7G-TRONIC PLUS) for improved efficiency.